Back Quarter (Shaft) – The shaft is the tall portion of the boot, above the foot, that covers the wearer’s leg. We typically just use the term “shaft” without mentioning the specific quarter portion, but some cowboy boots have varied designs on the front quarter and back quarter that require use of the technical boot terms. The back quarter is the portion of the shaft in the back of the cowboy boot. Most boot shafts are 10” tall to 15” tall, but some boot styles are available in 6” ankle boots or 8” short boots, and some taller boots are also available. Collar – The collar is the very top portion of the boot shaft. Some cowboy boots have decorative collar stitching or overlays. Dip/Scallop – The dip is also called a scallop. It is the V-shape at the very top front and back of the cowboy boot shaft. The styles vary, but the purpose of the dip is to prevent the boot from pinching your leg when you take a step. Boots without the dip are commonly called “stove pipe” cowboy boots or riding boots. 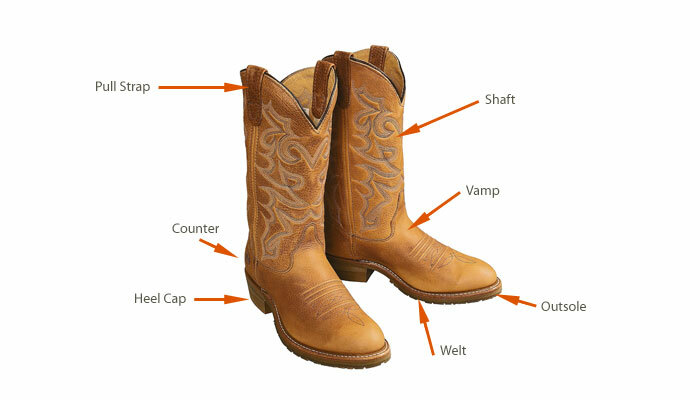 Front Quarter (Shaft) – The shaft is the tall portion of the cowboy boot, above the foot, that covers the wearer’s leg. We typically just use the term “shaft” without mentioning the specific quarter portion, but some cowboy boots have varied designs on the front quarter and back quarter that require use of the technical boot terms. The front quarter is the portion of the shaft in the front of the cowboy boot. Most boot shafts are 10” tall to 15” tall, but some boot styles are available in 6” ankle boots or 8” short boots, and some taller boots are also available. Heel – The cowboy boot heel is attached to the back portion of the outsole. Many heel styles are available, but the slanted “western heel” and lower “walking heel” are the traditional cowboy boot standards. Some heel styles are intended for fashion only and are not appropriate for riding or work. Heel Cap – The heel cap is the cover on the bottom of the cowboy boot heel. It is most often a composite or rubber material to provide slip-protection. 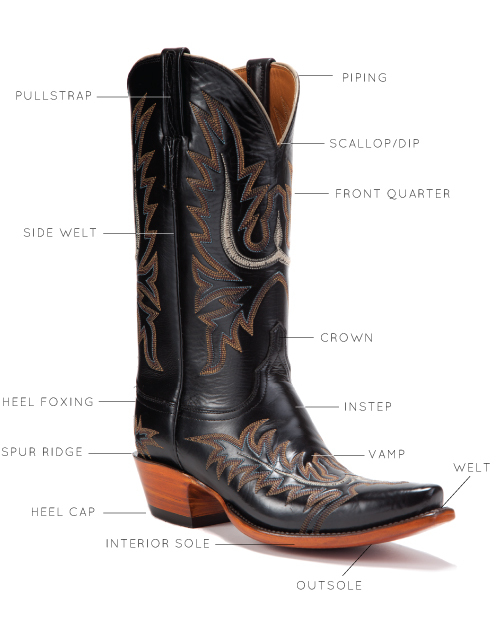 Heel Counter – When referring to the “heel,” most descriptions are describing the outsole portion of the cowboy boot. The heel counter, however, is the back part of the foot, above the heel and below the back quarter of the shaft. Insole (inside the boot, not pictured) – The insole is material inside the boot on which your foot rests. Many cowboy boots offer high-tech materials and cushioning to provide comfort and stability. Instep – The upper part of the vamp, toward the shaft. Comfort in this area is key in determining a proper cowboy boot fit. Unlike shoes with laces, a cowboy boot has only the instep to hold it securely to the foot. Hence, proper fit in the instep is of utmost importance. The fit should be snug, not tight or loose. Outsole – The outsole is the bottom portion of the boot that makes contact with the ground. It is attached to the boot upper and is sometimes simply called the “sole.” The materials used for the outsole vary greatly by style and purpose of the cowboy boots. Work boots tend to have composite and rubber outsoles, and traditional cowboy boots tend to have leather outsoles. Since this portion of the boot is exposed to the greatest wear, it is important to consider the function of your cowboy boots when choosing the outsole material for greatest durability and comfort. Piping – Piping is a rounded strip of material, usually leather, that runs up the side seams and around the top of the collar on boots. Not all styles have piping, but it is a common addition. It is used to cover stitching that holds the pieces of leather together and to cover exposed edges. Pull Tabs/Straps/Holes – Pull tabs, also known as pull straps, are attached at the top of the boot shaft, allowing the wearer to get a good grip to pull on the boots. Some styles have pull holes instead of tabs. Shank (inside the boot, not pictured) – The shank is the interior portion of the boot that is under the insole as reinforcement for the arch. It is most commonly thin strip of steel or composite. Spur Ridge/Ledge – The spur ridge (or ledge) is a functional design element on the cowboy boot heel. The heel extends a small amount past the back of the cowboy boot, creating a ledge for a spur to rest and not slide down the back of the heel. Throat – The throat is another term for the boot shaft (front quarter and back quarter). Toe Box – The toe box is a reinforced section of the foot that defines the toe shape. The most popular cowboy boot styles are square toe, round toe, pointed toe, and snip toe. Tongue – The tongue is the top part of the vamp. It can have a variety of decorative designs, but it most commonly comes to a point where the shaft and vamp meet. This added layer of material offers protection to the foot and durability to the leather when spurs are worn. Vamp – The vamp, also called the “upper” or simply “foot” is the area of boot that covers your foot, from the bottom of the shaft to the outsole. Welt – The welt, sometimes called a rand, is the stitched connection between the outsole and the boot vamp. A full-welt cowboy boot has stitching almost all the way to the heel portion of the cowboy boot. A three-quarter welt cowboy boot stitching goes to the mid-sole of the boot (under your arch). The heel area is usually pegged or nailed rather than stitched. Double-stitched welt is two rows of visible stitching, and single-stitched welt is one row of visible stitching around the foot, on the outsole.